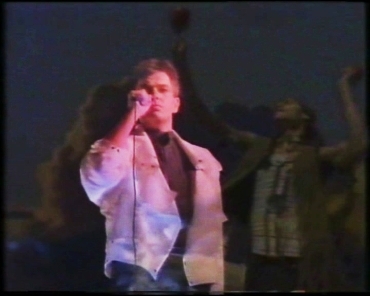 In 1987 Peter Gabriel went on a tour to promote an album that received huge world-wide success. Commercially speaking, So was the biggest thing he has ever done. The concert tour was accordingly a long one and new dates kept being added to it. Releasing a video of it was not quite a must then, but it was an idea that leapt to the eye. Still it took quite a while for an official concert film to appear, which fact can be attributed equally to Gabriel taking his time to work out things and to his joy of experimenting. Three years after the end of the tour an idiosyncratic film of the tour came out that features footage from the final shows of the tour at Lykavitos Theatre, Athens, Greece on October 05-09, 1987. 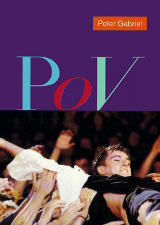 Its title, P.O.V. - point of view, indicated a personal view of the tour. In fact, it was not really a pure concert film, as additional material was used. The film has been released only on VHS video cassettes, unless you count the Laserdisc format that was a niche product even in its heyday. Many fans fervently hoped for a re-release on DVD and/or Blu-ray, particularly since the film is out of print. Gabriel himself raised these hope even more everytime he mentioned that a release might be possible. The first time that happened was in 2005 when the bonus material of the Still Growing Up – Live And Unwrapped DVD featured No Self Control from P.O.V. as a teaser and the complete film was announced to come out the following year. 2006 came and went without a trace of a digital version of the film. Rumours fell silent. When the 25th anniversary of So came up in 2011 rumours thickened again, fed once more by Gabriel himself. Finally something is going to be published: The So25 Deluxe Edition of 2012 will contain a film called Live In Athens. According to announcements this will be a version of P.O.V. that contains almost the complete concert – which also means that all additional scenes and cut-ins have been removed. That makes it a regular concert film without the personal, subjective point of view. The name is therefore not Point Of View anymore, but Live In Athens. 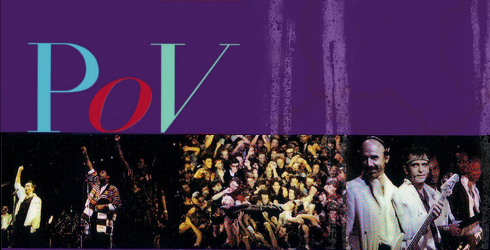 This review concerns itself with the original version of P.O.V. A review of the Live In Athens film will be provided once the DVD has been released. The stage show was relatively simple, even for the mid-80s. The stage was hung with black cloth, there were some hexagonal platforms, that was all. Another important element were the four movable racks of spotlights that could be used to create stunning effects. The lighting dollies could be moved all around the stage on rails. They had a sort of arm that was several metres long and had three Varilites that allowed for rapid changes in the size, colour and direction of the light beam. These four lighting dollies could move to almost any place on the stage, could provide light from up high or from just above the stage level – and the dynamics of their moves were most impressive. They were essential for the staging of the show. Apart from that Gabriel won over his audiences less with concepts and more with his personality. He seemed close, serious, modest but uncompromising, agile and vulnerable, and through all this greater than hardly ever again later on. His intense and expressive gestures coupled with an urge to move provided a powerful, lively performance. He was accompanied by a band that consisted of extraordinary musicians only. Unmistakable David Rhodes and irreplacable Tony Levin were the old hands. 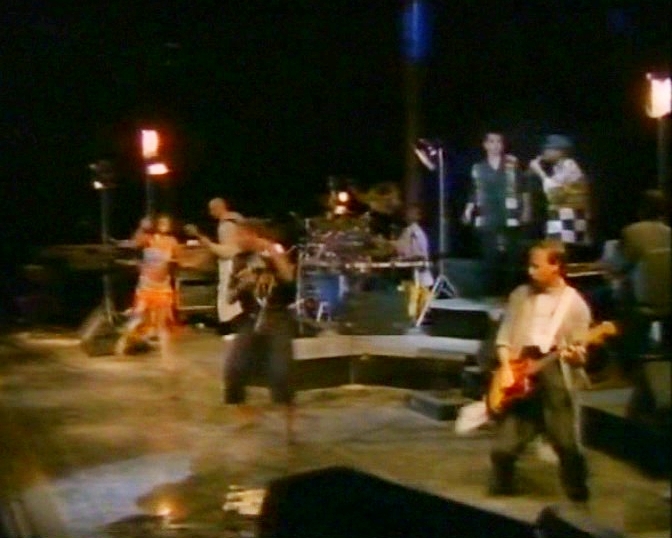 Manu Katché on drums was one of the new guys who brought a lighter touch into the music with his percussive, playful drumming; another new face was David Sancious, perhaps the biggest keyboard virtuoso Gabriel ever had in his live band. Sancious added a touch of jazz to many songs. And Gabriel himself sang in a voice that was at the very peak of what he would ever master in strength and expression. Live director Michael Chapman goes for traditional shots, films with a steady hand, uses creative perspectives and generally manages to capture the lively pulsating essence of the stage show. Then they had the idea of adding additional footage. Hart Perry was responsible for what the credits call Home Video. The source of this are super-8 films from Gabriel's family archive, some of which are quite amusing, documentary footage culled from other archives according to the topic of the song – and shots of Gabriel's face. The latter have obviously been done quite some time after the tour in the studio, for his hair is longer, he seems tired and generally different. The film could have done without those shots, for they add nothing to it. All these snippets link into the live footage in the most unusual ways: They push in from the sides, tear through the image, fade in or are cut in between songs a little clips. 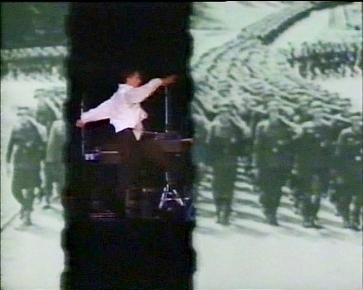 They expand the experience and make the concert film an art film, but they also interrupt the live performance. The result is something one needs to make up one's own mind about, and there are two generally opposing views about it. Some people complain that the film was too dark, but since the stage was clad in black cloth there is not much that could be light. The colour concept of So was mainly black and white, and so was the production design of the tour. What is really regrettable is the fact that some songs are missing from the film. Red Rain, Family Snapshot and The Family And The Fishing Net are missing. So is Big Time, which was not really a great live version then, and a full version of This Is The Picture. The order of the songs has been changed quite radically, too. Right at the start we find out what it is with the additional material. This Is The Picture is only there in parts, mainly from the beginning to the first chorus. First you see Peter and his video camera filming himself in the hotal mirror („point of view“), then there is footage of press and tv photographers, backstage areas, the concert venue and other place from his point of view. The longest part of the song is where the musicians are introduced as in the concert (even though the song did not kick off the song but occurred somewhere in the middle). For every member of the band there is a brief collage of various film snippets from Peter's camera. Confusing, weird, funny, colourful. Shortening the song like this and placing it at the beginning is an idiosyncratic decision, but as far as intros are concerned it does work. When This Is The Picture gets going its sounds blend into those of San Jacinto, the song that really used to start the concert. Peter's dignified gestures amidst light beams and darkness underlines the song. There is nothing from the pas de deux with the light dollies in the film; we get to see images of clouds, fog and the faces of native Americans which takes away nothing from the intensity of the performance. A short bit of a family video leads into Shock The Monkey: Mr and Mrs Gabriel, accompanied by their daughters Anna and Melanie sit inside a car in a safari park and enjoy the sight of a little monkey that sits charmingly on the hood of the car. Considering what the situation must have been like at the time for the Gabriel family this is pretty revealing. It is a remarkably quick version of the song in which Peter hurries as quickly across the stage with David Rhodes as an agile partner. David Sancious and Manu Katché do a good job at giving the song some jazzy playfulness. The song is not interrupted by non-concert footage. Games Without Frontiers has had a musical make-over, too. An interlude adds drive and speed to the song. Apart from Gabriel's goose-stepping across the stage there are lots of intense and uncomfortable photos of children in war or playing at war; these push into the performance, tear across it or interrupt it otherwise. The montage for the closing bit of „No more war“ has a high density. A selection of footage from press conferences from the Conspiracy Of Hope tour for Amnesty International follows. What we get to see are mainly rock stars being silly to the sound of Slow Marimbas. 'Brooding and remarkably slow' is the first impression we get of No Self Control. Gone are the times of the hectic sound confusions on the Melt album. Manu Katché adds intricated drum and percussion over a percussion-based beat. The footage from the Amnesty tour continues, but now it shows foreign countries. They give way soon enough to show Gabriel's hypnotic performance of the song combined with some black-and-white shots of his face that were added later. The famous struggle with the lighting dollies is captured really well, though. Mercy Street was one of the highlights on the tour. Like a broken man, Gabriel lies on the stage floor, gently touched and stroked by light beams from the VariLites before he begins a painful crawling and crying. Tony Levin provides a real crossfire of numerous bass lines. The montage of the large audience and Gabriel's silhouette 'looking for mercy' is intense. However, he is also shown singing this song at home at his keyboards. Does this intimate that the sound was enhanced in the studio? From here on the order of the songs in the video is wildly at odds with the order of the concert. This is apparently so in order to keep up the dramatic tension. Why the instrumental intro to Sledgehammer was left out is quite beyond comprehension (and it would be repeated on the Secret World Live CD, too). The song begins with Gabriel counting them in. The version is not at all up with the original, though we get to see the bizarre line dancing trio of Levin, Gabriel and Rhodes as well as Peter's lewd hip movement. Who ever came up with that? Thankfully there are no interruptions apart from the beginning. Non-concert material also occurs only at the beginning of Solsbury Hill. 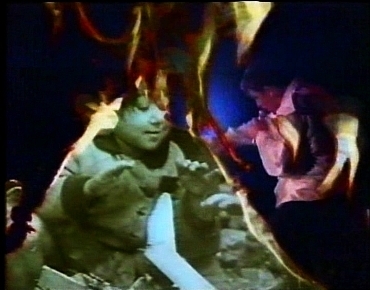 It is mainly material from Gabriel's family film archive, as in the video clip from that period. This adds another dimension to the rather personal lyrics. The three front man dance merrily across the stage. It is quite an in-your-face version but somehow a bit generic. Next is a bit from the recordings for Shaking The Tree. Interrupting the show like this is a bit peculiar. It is nice, though, to see the maestro at work and which gestures he uses if things do not work out well. Another highlight of the concert is Lay Your Hands (the cover mysteriously omits the On Me). The music is tentative and dark, contrasted by rattling rhythms. Gabriel mimes the defense against unfeelingness, hurls out his „over me“ into the world until everything ends in complete darkness – before he gives in to Katché's giant drum rolls and hands himself over completely to the audience in his quest for contact. The show goes straight on with Don't Give Up which is a bit of a downer, especially so since it is not the most brilliant version. The guitar riffs and Rhodes' solo are really beautiful, but the song lacks a female voice (or indeed, any second voice at all) to retain the tension of the song. Gabriel sings Kate Bush's part in a lower voice, which takes away its urgency. The performance is mixed with pictures of beggars, jobless people, run-down parts of town. They make their point, but are not really original. In between there are some shots of Gabriel's face in the studio. After a brief intermezzo with impressions from the very first WOMAD festival there is a real big favourite: In Your Eyes is celebrated as a joyful party. Youssou N'Dour, who went on to become a world-wide star in his own right, sings guest vicals. The whole band dances around merrily, two men sing a fiery duet, celebrate friendship and keep moving all over the stage – with old-fashioned cable microphones at that. The song itself has received a very neat make-over: A basic rhythm provides vibrations, several sections offer a change between wild and quiet bits – and David Sancious' brief grooving piano solo has been copied very very often, but has never been surpassed. The final song is Biko. What else. The subject matter was still very current in 1987 – after all, apartheid is not fully abolished in South Africa until 1994. So it is quite appropriate to feel moved by all those raised arms. The end captions scroll over the final calls of the audience; concert and film have ended. P.O.V. captures a touching show and does it well. The cinematic devices may not be to everybody's liking, but they add to the overall experience. If nothing else this is the documentary of a strong stage presence that is still great to watch. What a pity that this has never been put out on digital media. .